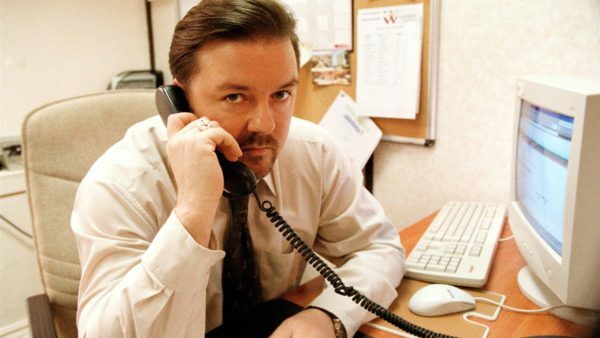 David Brent (Ricky Gervais) makes a phone call on the UK version of "The Office" (Courtesy of BBC). David Brent (Ricky Gervais) makes a phone call on the UK version of “The Office” (Courtesy of BBC). If you can’t sit through the many hours of the awkward yet hysterical humor of NBC’s “The Office,” you might find the original U.K. version too much to handle. Yet for adventurous viewers, it might be the best thing to complement strange family reunions with multitudes of uncomfortable interactions, particularly with Thanksgiving break coming up soon. This version, also called “The Office” (produced by BBC from 2001-2003), is less known, but is in fact the predecessor of its more famous brother, which spawned a mockumentary television revolution in 2000s comedy and brought about a new era in U.S. entertainment. Within the show, we find the purest definition of a jerk that you might find, David Brent (Ricky Gervais in possibly his most perfect role), who is the boss of the office. His employees are dismal and hate him, but they don’t know what to say without angering him. Brent embodies so many qualities that many people, as a general population, tend to hate – hypocrisy, disrespect, patronization, selfishness and immaturity. It’s almost visually and emotionally abrasive to watch Brent verbally abuse his employees, and during the moments when he is completely embarrassing himself, I really just wanted to cover my eyes and crawl in a hole. I rarely achieve this level of discomfort when watching television, which is why “The Office” is so interesting to me, even if the show as a whole is not particularly alluring to me as a viewer. Cringe comedy to its core, the U.K.’s “The Office” is peak unpleasantness for viewers and characters alike. There’s something voyeuristic about watching the suffering and discomfort of other people, especially in situations that we can relate to, including the workplace setting of “The Office.” Nevertheless, it’s fascinating to look at the fact that the U.S. version of “The Office” at least involved some characters and relationships that you may have been supporting throughout the run of the series. In the U.K.’s “The Office,” it’s very easy to say that you probably immediately jumped to hating everyone – and you’re not to blame. Even beginning with the start of the show, the title sequence of “The Office” can only be described as dreary. With production design that emphasizes the grays and muted colors of the building and landscape, “The Office” epitomizes your classic 9-5 p.m. office job that you hate. Nothing about “The Office” is really attractive to viewers – there are no likable characters and no particularly strong narrative – so why is it worth the watch? In a few short phrases, “The Office” is unlike anything you may have seen before on TV. To me, it’s almost a television equivalent of an art house film (but without the hallmarks of experimental film style) – certain parts of the work are neither conventionally entertaining nor interesting, but the overall work itself still brings a form of intrigue to the audience. This is where “The Office” excels – many contemporary American works try so hard to entertain and attract their audiences that they get swept away in complicated storylines. Most of the time, this is a positive thing, as TV shows begin to compete for a place within our own lives and draw us to certain shows – but there’s really no room in U.S. television to approach more experimental or untraditional work. At the same time, the very thing that placed “The Office” in its own box was what brought it down – the show only ran for two seasons (although it did have a number of user-uncomfortable Christmas specials). The 2016 mockumentary film “David Brent: Life on the Road” was Gervais’ attempt to bring back the character of David Brent. Even though the film itself didn’t live up to the sheer awkwardness of the original series, the accompanying music video is still entertaining enough that it deserves a chance. If you need something to stir up your typical TV binge-watches over the weekend, you can probably zip through the UK version of “The Office” pretty quickly. If you’re turned off by the characters or narrative, give it a little time – by the moment you finally settle in, it’ll probably be over (there are only 12 episodes!). Nevertheless, viewers be warned when watching – tread carefully around this cringe comedy.